Restylane® and Perlane® Plastic Surgery treatments are an innovative approach to reducing and can even eliminate facial wrinkles. Deep laugh lines, nasolabial folds and lines around the mouth and lips can all be treated. The products can restore the youthful volume to the face and fullness of lips. Restylane® is made of hyaluronic acid, the same viscous substance that lubricates our joints! 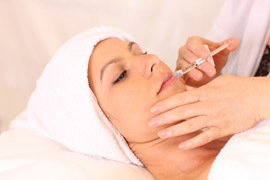 Both products are FDA approved for the treatment of moderate to severe facial wrinkles and folds. The areas that will be treated may be marked and photographs may be taken in order to follow the improvement after the procedure. To avoid bruising and bleeding, drugs, vitamins and herbs that thin your blood or prevent platelets from clotting should be avoided. ASK ABOUT PRO-NOX to make your experience more comfortable and stress free! Our practice is pleased to offer you this proven analgesia option, Pro-Nox! So you can manage your pain and anxiety during your medical procedure. The Pro-Nox is a 50% Oxygen and 50% Nitrous analgesia mixture which enables you the patient to self-administer it through a specially designed on-demand valve that only delivers the medical gases when you breath in and need it. These injections are performed very comfortably in the office under local anesthesia.. Because this is a substance that is also naturally-occurring in the body, results are not permanent. Initial results typically last 6-12 months; however, with repeated injections on regular intervals, the results can become progressive. We also participate in the ASPIRE Galderma rewards program which means more savings for you! Silk is designed to provide precise lip shaping and line control, resulting in silkier, smoother lips and natural-looking results. Restylane Silk is designed specifically to provide natural-looking results in the lips by using smaller, smoother particles than those used in other Restylane® products. This item is currently under development. Please check back later for information about Restylane® Lyft.